I waited (and trained) for that day since December 20th, day of my registration for the Lavaman. 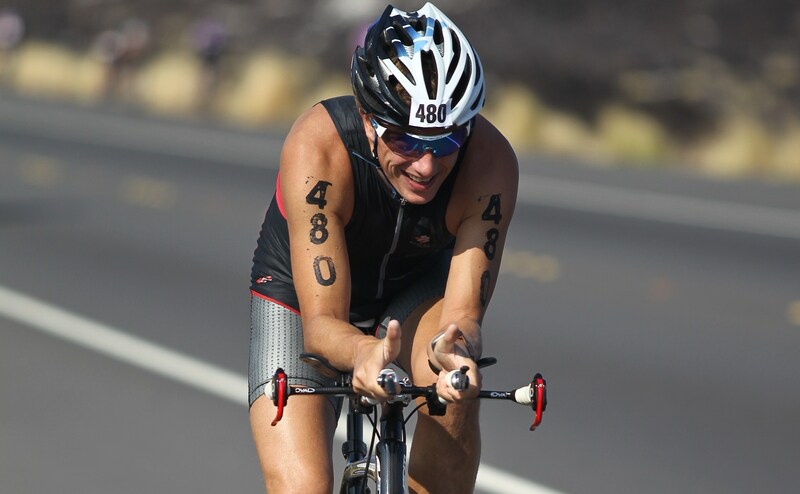 This triathlon is the second biggest tri event on the Big Island after the Ironman World championship. It is an Olympic distance and happens every year at the end of March. Chris McCormack describes it as follows in his last entry of his blog (April 2nd) “It is a tough, windy bike course and a super hot and difficult run. The entire bike course takes in the most difficult section of the bike course at the Ironman World Championships, and the run is mostly off road and through the thick Lava flows. It really reminds me of some of the early races I did in my career, when these ingredients seemed to be a prerequisite of a triathlon” . 1020 athletes coming mostly from Hawaii and the West Coast of Canada and the USA were gathered for this event. Chris McCormack, 2 times IM world champion was also at the starting line. The race starts at the Waikoloa Beach Resort onthe west coast and the bike course is a segment of the World Championship on the famous Queen K. Highway. This race was for me the big test whether I had trained enough and done enough rehabilitation after the accident on June 8th the previous year. It would tell me, whether I was ready to train for longer distance and be able to be on the starting line of the Ironman of Frankfurt later this year. I thought the race would be hard, but it turned out that it was getting there that cost me most energy. 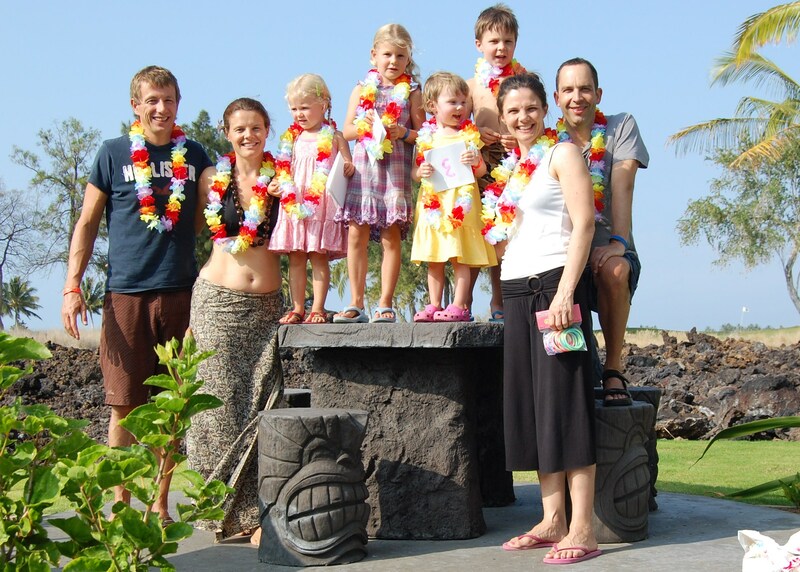 My family and I are currently staying on Kauai and I had to take 2 planes (via Honolulu) to get there. The first plane had 4 hours delay, the second was cancelled and the company had lost my reservation…In the end, I just made it in time to retrieve my starting packet, to put my bike together and to test it before sunset. I nonetheless could go early to bed and have a surprisingly good night sleep. I wake up at 5:00 AM and take a short breakfast in bed. The weirdest thing after taking a shower is to put sunscreen when it is still pitch dark outside. I do that nonetheless, because I know that today’s forecast is 30 degrees, low wind and 86% humidity. I get out of my hotel room, the sun greets me and I take a picture of it in return. Coming to the transition zone, most of the athletes are already there… loud house music is blaring through big loudspeakers and a commentator repeats with eagerness the do’s and dont’s of the day. I get myself ready in the transition zone, get body marked with the No480 and walk slowly to the start at the A-Bay, a beautiful little cove. I enter the water at 07:10 and swim 4o0m to warm-up the shoulders. At 7:36 I start in the 3rd waves (that are Male Athletes 40 and Oooolder). I don’t pace myself. Feeling strong I aggressively make my way to the front of the pack. The real good swimmers are ahead and I can keep a good pace (around 15:30 per km) for the entire 1500 with the pack. I exit the water after 23:20′ and make a 300m dash to the transition zone. The enter of T1 comes at 15:24. I exit 1:31 later to start the bike. At this time, my position is in the first 75 or 80 athletes. The bike leg starts very well with a 37kmh for the first 8km and suddenly the wind changes. Everyone gets it strong in the face for the next 12km. The average speed drops to less than 32kmh and legs are sore. The mid-point turn comes at the right moment. From then on, it is tail wind and I finish the bike leg in 1 hour 11 minutes, which is above 34kmh avg. I run through transition very fast. So fast that I forget my helmet and have to return to deposit it next to the bike. In the end it is 1:41 in T2. The first 500m run go well and suddenly stomach cramps are coming. Strong ones. I immediately know that it comes from a new sports drink I had during the bike. I work through these cramps for the next 3km. It is hot, I cannot breathe regularly. I am smiling thinking that my knee would hurt, but no, it is my stomach that slows me down. I finally find my rhythm after 5k and start running at a 4:45 pace between km 6 and 8.5. 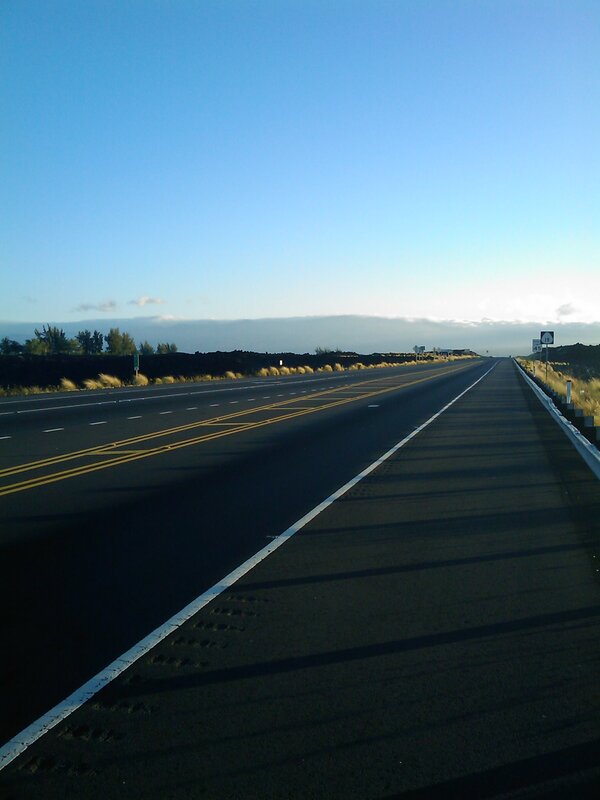 The last mile: it is not hard surface but all lava stones and broken corals. Worse, the last 400m are in soft sand but at this point I see the 2 athletes in front of me pick up the pace and I decide to hang on, which I can and do until the finish line. 20 meters before the finish line, I raise my arms, fist closed, throat thightened. It is a great liberating moment. At this point the total time does not matter anymore. It is the knowledge that my knee held the shock of the race, it is the knowledge that I can race again, that my sports days are not over. I do the run in 50:12′. Time overall is 2:30’10”. Position 122 out of 1020. Chris McCormack wins the race for the 2nd consecutive year. 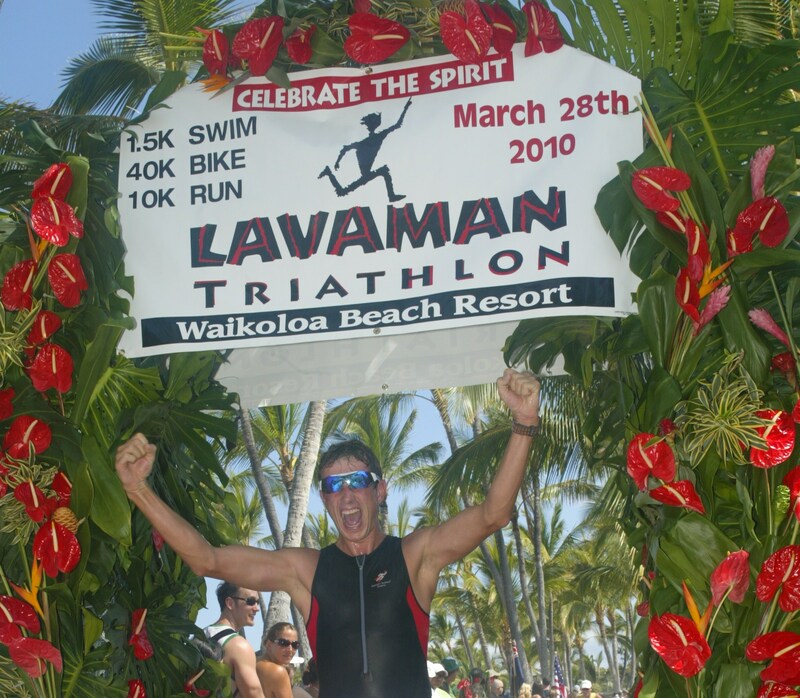 The Lavaman triathlon is the best organised and most scenic tri-event I have done. Compare to Europe, I found many athletes very relaxed ready to enjoy the race. The quota of female athletes was incredible, something I have never seen in Europe. All in all, this triathlon is maybe not worth the trip from Europe, but it is a must do, if you are around in March in Hawaii. The only reason we left Wanaka and New Zealand was the planned family reunion on February 17th on the Big Island in Hawaii. We had planned this in August last year already! 2 weeks of vacation with Isa’s sister and her family as the only fixed point during our year around the world. It took us 3 days to get the from the South of New Zealand. No need to mention that M. & Z. were quite disoriented, confused and cranky for the first few days. The best for me was of course to be on THE triathlon Island, the place where the Ironman World championship takes place every year. 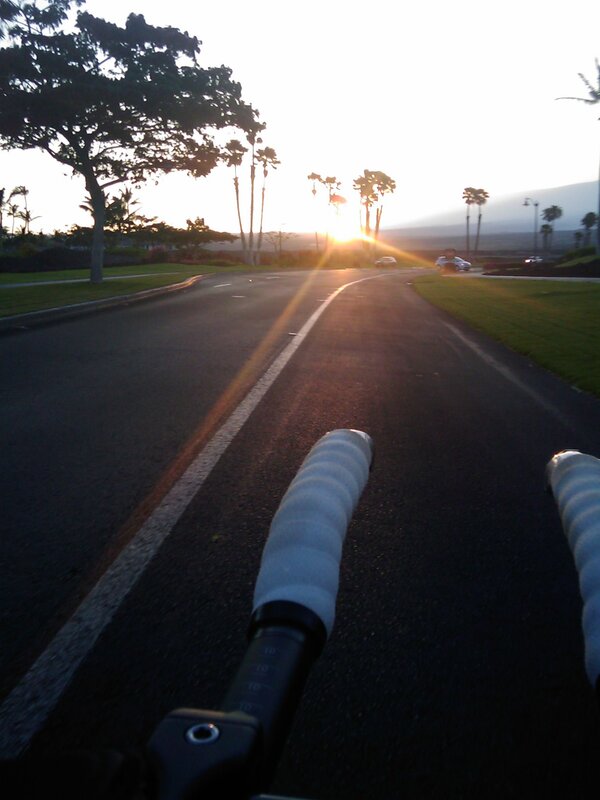 Not necessary to mention that I assembled my TT-bike on the first day to hit the mythical Queen K. already on the second day! What a feeling to ride on this highway where all the best triathletes in the world have sweated their guts out. I feel very motivated, all the more that I will be competing in the Lavaman Triathlon on March 28th on the very same road. It will be my first race since May 2009. Apart from Training and Sightseeing, we spend most of the time at the pools of the vacation resort. It is the best family friendly pools I have seen, with small beaches for kids, 4 different water slides for kids and adults, hot pools, pools with Dolphins, protect natural lagoon, etc, etc… amazing. Perfect to spend 2 weeks with the family with 4 young children. The other great thing at the resort is the BBQ place. We have already used it a couple of times to sear delicious american steaks and others treats. Will I lose any weight during this period? I think I have trained 12 hours this week and increased my belly buoy by an inch! Anyway, that’s part of family meets. You talk, you eat you drink and you start all over again….and you celebrate birthdays! That’s right we took advantage of this reunion to anticipate Zoé’s 3rd birthday…but that is a different story.